We will never tire of looking at this sequinned cocktail dress, never! This shimmering mermaid inspired belter of a vintage party dress, is the ultimate in partying attire. We adore the opulence of the all over beading and the rich jewel tones are totally on trend. The beginning of the 1980s was all about Dallas style OTT dressing and this vintage sequinned wiggle dress from Aftershock is a lesson in power dressing. We know you will get so much wear out of this late 1970s style dress and the sleeves make it more appealing on those cold snap nights. Team block heels and cocktail rings with this green sleeved dress to complete this carefree, Cara Delevigne style look. 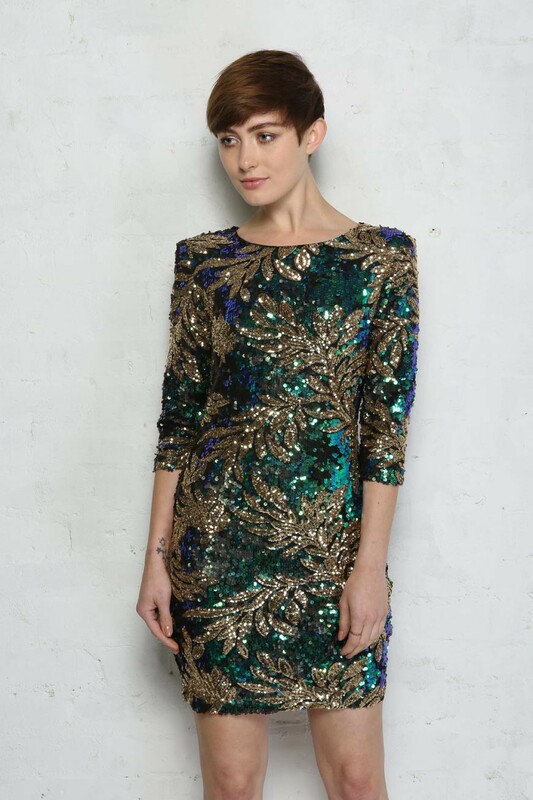 This is a short sequinned fitted dress in all over green, blue and yellow decoration featuring long sleeves and a high round neck.